The Northeast Creek watershed basin lies within the Durham Triassic Belt. Triassic basins are rift valleys filled with sedimentary rocks that formed during the Triassic (about 200-190 million years ago). Today rift valleys of East Africa are most like the valley that collected the mud, silt, sand and gravel from adjacent highlands that form the mudstones and sandstones that you find in the Northeast Creek watershed. The mudstones are mined and processed to make brick, such as those made at the Triangle Brick Company on NC 55 in the Northeast Creek watershed. 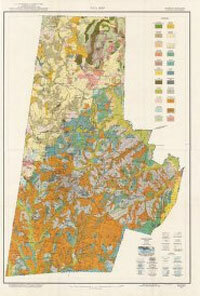 This soils of the Northeast Creek watershed basin are those of the White Store-Creedmoor association. The soils of the Northeast Creek floodplain are those of the Chewacla association. Soils are classified by the place they were first identified. White Store is in Anson County, NC, in the Wadesboro Triassic Basin. Creedmoor is in Granville County, NC, in the Durham Triassic Basin. Chewacla Creek forms a broad floodplain near Auburn, Alabama. White Store soils are moderately well-drained. They have a sandy loam surface layer underlain by a strong-brown firm clay loam and yellowish-red very firm clay. Creedmoor soils are also moderately well-drained. Their surface layer is sandy loam. The upper part of the subsoil is pale-brown or brownish-yellow, friable sandy clay loam, and the lower part is light yellowish-brown or light-gray, firm or very firm clay or silty clay. Chewacla soils are poorly drained soils on floodplains, composed of soils that washed from uplands. The surface layer is dark grayish-brown silt loam. The upper part of the subsoil is mottled dark-brown and light yellowish-brown silt loam. The lower part is mottled gray, brown, and yellowish-brown silty clay loam. Chewacla soils are flooded frequently for very brief periods.